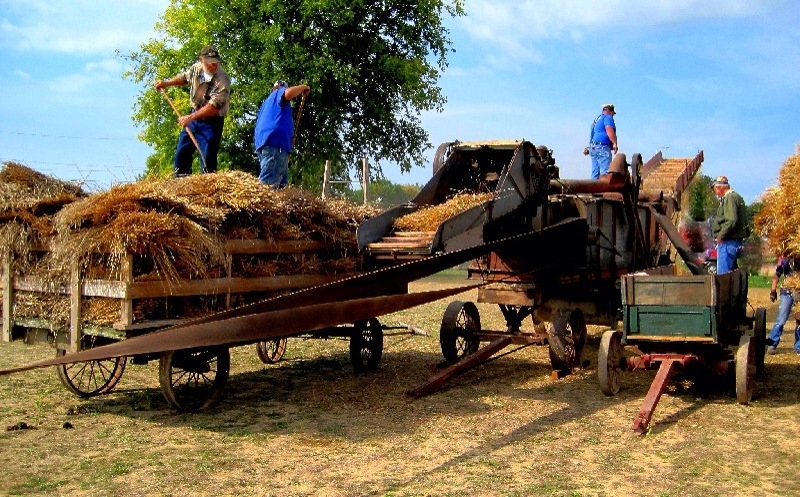 It’s That Time of the Year Again – 45th Annual Threshing and Antique Show This Weekend at Freeport! This annual event begins on Friday, August 1 and ends on Sunday, August 3, 2014 at the Stephenson County Fairgrounds, 2250 S. Walnut, Freeport, Illinois. Friday and Saturday from 7 am to 8 pm, and Sunday 7 am to 5 pm. It offers over 300 antique steam and horse-powered engines and equipment, and gas engines. This year’s feature is Allis-Chalmers tractors and equipment. There will be a huge parade daily at 1 pm, a large flea market, a large display building offering a large antique transportation display, home antiques, crafts, demonstrations, and farm miniatures. Gasoline Alley which will feature Rawleigh, Rawleigh-Schryer and Ziegler-Schryer gas engines and products, sawmill, and blacksmith shop. Also ride the Silver Creek and Stephenson Railroad antique steam train. Food is offered including a variety of food stands, plus breakfast from 7 am to 9:30 am and a noon dinner from 11 am until 1 pm. A Farmer’s Hitch Class Horse Pull will be offered on Friday at 6:30 pm. A Midwest Championship Antique Tractor Pull will be held on Saturday. On Sunday, there will be a kiddie tractor pull after the parade. This entry was posted in Events, Farming and tagged Stephenson county, threshing show on July 30, 2014 by Good Day Illinois.